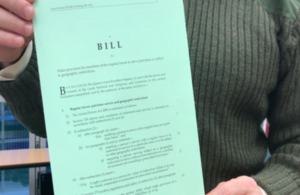 The Armed Force Flexible Working Bill, which became law on Thursday 8 February. The measures, which achieved Royal Assent on Thursday, will allow some military personnel to serve part-time for defined periods. Consultation within the Armed Forces has found that personnel want more choice over the way they serve when their personal circumstances change, such as having young children, needing to care for elderly relatives, or taking on further training and education. Personnel will also be able to restrict the amount of time they spend away from their home base and their families. The plans, which will come into effect in 2019, are part of a range of measures the Armed Forces are implementing to become more modern and diverse. "This change will make it significantly easier for our dedicated Armed Forces to raise their children, care for elderly relatives, or look after an ill family member. "This will ensure we are able to retain and recruit the brightest and the best from all backgrounds to keep Britain safe." "Flexible work is key to retaining our expert personnel who we’ve invested in during their military career. "Personnel have told us they want more flexibility and we have listened - that’s what this Act delivers." Internal MOD surveys have consistently reported the impact of service on family and personal life is the most important factor that might influence them to leave. The measures are part of military modernisation, aiming to retain personnel who have been trained and have gained important experience, particularly on operations, rather than having them leave for civilian life. 96% of UK employers already offer flexible working for some of their employees and research has found that offering flexible working encourages people to stay with their current employer.